I came across the Clare Castle Hotel when I heard someone refer to it as "Port Melbourne's best kept secret for the past 100 years". Best kept secret is right because in the nearly 8 years I've been running ParmaDaze it has managed to completely sail under my radar. I like to do a bit of research on our targets before we visit, but the online presence for the Clare Castle is minimal - Their Facebook Page is quiet, the Instagram is the same, It's almost if they are going out of their way to remain mysterious. And of course, I couldn't accept that. So last night we loaded up the Parma Bus™ and headed to Port Melbourne, and the oh-so intriguing Clare Castle Hotel. Nestled beside the Graham Street bridge you could blink and miss the Clare Castle, however they are in good company, with both the Colonial Brewery and Starward Distillery now only a stone's throw away. The best way I can describe the CC is an old school country pub that just happens to have landed in the middle of Port Melbourne. It is absolutely dripping with old world style and charm. Walking into the front bar, if it weren't for the TAB machines and LCD Screens, you could swear you were stepping back to the 80's. From the sports memorabilia to the ashtray trough at the bar, the Clare Castle is a pub out of time. Through to the bistro, however, things take a much classier turn. White tablecloths are abound, there's a crackling open fire and the walls are covered in some fantastic art of Melbourne and surrounds. The Clare Castle's primary interest appears to be steak, with jaw dropping steak selection headlining the menu, as tempting as a hearty, well cooked piece of steak would be, we managed to tear ourselves away - finding the parma listed under "Old Favourites", along with other old school pub classics such as lambs fry, housemade rissoles and crumbed lamb cutlets. Sounds delightful. I do believe I shall partake. As you'd expect from an old school pub such as the Clare, the tap list was pretty basic. Carlton, Blonde, Great Northern. There were a few more options in bottles behind the bar (Not often you see VB Longnecks for sale at a pub these days) but if you're a fan of craftier beer options you're probably going to be disappointed. The schnitzel was impossibly fresh, pure white and insanely juicy - I suspected we would get top notch ingredients with this parma and was not disappointed. Decently sized but not huge. The crumbing was applied sparingly, which was great - however the moisture in the schnitzel took away the expected crunch that we enjoy with our parmas, hardly a criticism though, the schnitzel was piping hot, fresh, and laid fantastic groundwork for the toppings above. The cheese was gooey and delightful. Applied in abundance with a subtle tasty bite. The napoli tasted as fresh as if the tomatoes were plucked out of the ground this morning and the ham was applied liberally. 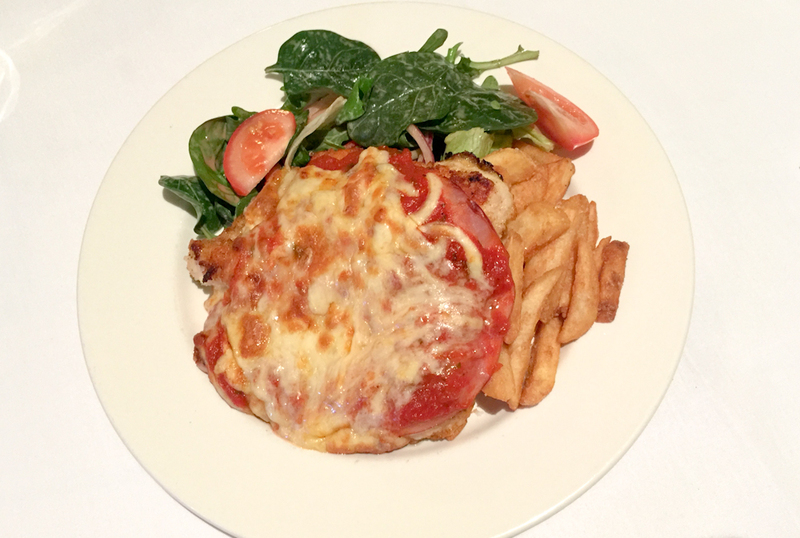 An expertly executed parma. However I can't help but feel that the toppings were missing something. The cheese, the ham and the napoli were all technically great - But the Clare Castle's parma needed something to drive it home. Maybe a stronger smoked ham, or a dash of tobasco through the napoli - Something to give it a bit of personality. Don't get me wrong, this was a super enjoyable meal, it just needed a bit of flash to make it a home run. The beer battered chips were great. Well seasoned and piping hot - I couldn't help glance over to the other tables with the massive hand cut, house made potato wedges that accompanied all of the steaks, and wonder what I could do to get those beauties with my parma - They should really share the love with those things... But the beer battered ones we received were fine none the less. When the plates hit the table the salad looked like a bit of an afterthought - However I was pleasantly surprised to find a well dressed, fresh garden salad with a decent amount of non-lettuce ingredients thrown in, including a liberal whack of capsicum - a most enjoyable side. I'd happily shell out another 24 clams for the Clare Castle's parma - There is no denying that they use top notch ingredients to turn out a top tier meal. If $24 is too rich for your blood, however, I did notice that the parma in the front bar clocked in at $18, and all the meals looked like they were coming from the same kitchen - Might be worth a crack in there if that is more your speed - But I was happy to shell out the extra cash for the much nicer atmosphere of the Bistro. I love old school pubs, and a visit to the Clare Castle is like a trip through time. The pub itself is almost a tick in every box, and is a few craft beer taps away from being the perfect local watering hole. The parma is definitely worth checking out, however, if I were to head back I don't think I could look past getting one of the outstanding looking steaks - And I fully intend to head back this weekend and try one of them for myself.